Bringing Sri Lanka back into India’s sphere of influence in the region’s geopolitics may be a greater priority. There was more sound than light to Prime Minister Narendra Modi’s visit to Sri Lanka. Though the trip was meant to be more ceremonial, with heavy religious overtones as it was tied to the International Vesak Day celebrations, there was a diplomatic victory of sorts as Colombo had just denied berthing facilities for a Chinese submarine. This might be a temporary setback for China, that is hosting the far bigger Belt and Road Summit in Beijing, but India might take heart that its wooing of Sri Lanka appears to be paying dividends with President Maithripala Sirisena in command. 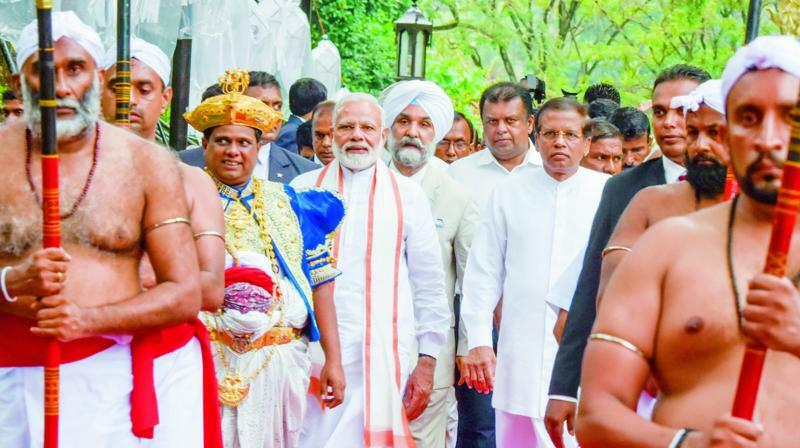 Mr Modi’s emphasis on ancient Buddhist links, stressing India’s importance as Buddha’s birthplace as opposed to modern China’s anti-religious stand, might do more for progress in ties, with direct Varanasi-Colombo flights likely to help too. With Mr Modi’s heavy Tamil-friendly rhetoric, keeping the highest praise for Sri Lanka’s celebrated symbol of religious diversity in Tamil spinner Muttiah Muralitharan and former Tamil Nadu CM MGR, it may have come as some disappointment that the festering issue of Tamil Nadu’s fishermen detained regularly by the Colombo government never came up for serious discussion. New Delhi’s perception may vary greatly from what Tamil Nadu feels, as its fishermen are the ones under pressure, but New Delhi may not have done as much as it could to resolve the matter. Of course, bringing Sri Lanka back into India’s sphere of influence in the region’s geopolitics may be a greater priority. That much was made quite clear by Mr Modi’s trip to Colombo and Kandy.